Happy Wednesday, Everybody! 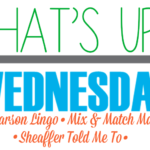 It’s time for us to join up today with Shay and Mel and let everybody know WHAT’S UP with us this fine Wednesday! BEFORE I START WITH MY WHAT’S UP WEDNESDAY POST, I HAVE AN UPDATE ON HOLT. If you’ve been following along, you know that my cousin’s 3 year old son has been going through various tests to see what’s going on in his little body. It’s been a long journey (tests started back in February), and it’s with great sadness that I let you know that sweet Holt was officially diagnosed with cancer on Friday. Please go HERE and read the latest CaringBridge update written by Alden, Holt’s precious mama (and my cousin). You will be absolutely blown away by her faith, and I hope you will feel led to pray fervently for this family and this sweet boy. You can also follow Alden on instagram HERE. They want as many people praying for their boy as possible. They know that with God that ALL things are possible. I’m working behind the scenes on a couple of different ways you can help Holt if you would like to. I will be dedicating an entire post to Holt that will hopefully go live next week, and it will outline several ways to support him! But in the meantime, PLEASE PRAY. 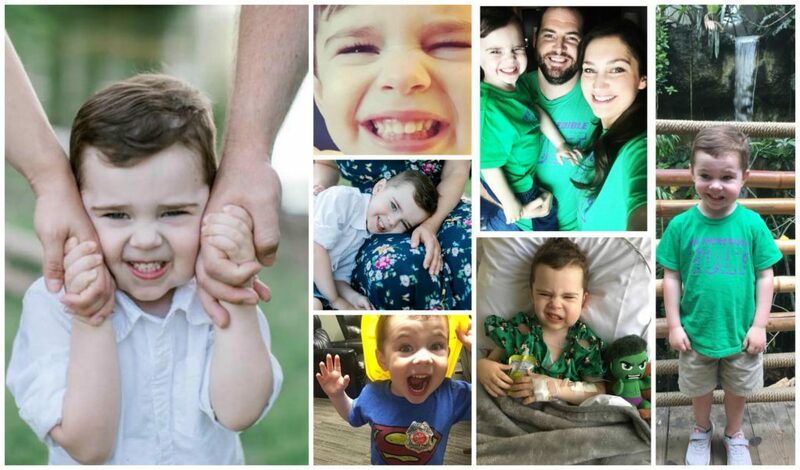 Sweet Holt and his family need all of our prayers. We eat the same dinners here over and over right now as we are continuing our healthy eating journey (grilled chicken, fish, grilled shrimp, lean tacos, and lean burgers). 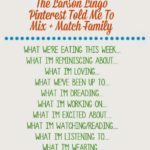 HOWEVER, we have a TON of new snack foods that we are loving that are all linked in Monday’s post! Go check it out! Carter turned 10 on the 10th. TEN. TEN? How can it be. 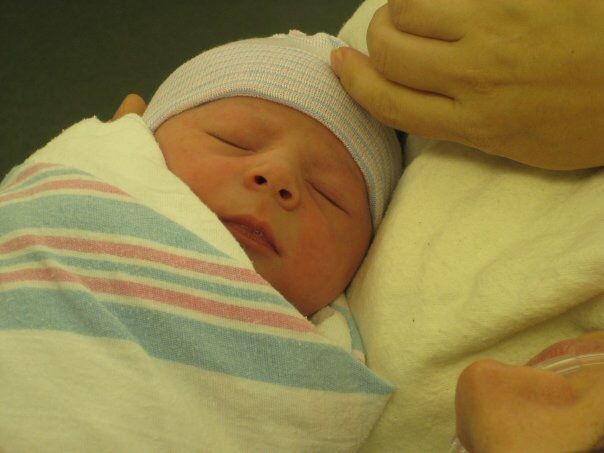 Right here he was just a couple of minutes old. And here he was a couple of days old. And look at sweet Scout. What I would give to snuggle those sweet babies again. I continue to get lots and lots of questions about Kopari products lately. I did a sponsored post with them last month, and I now receive questions on the products every single day. I’m working on a post where I share tons of details on the deodorant (it’s my MOST LOVED product of all of them and the ones that most questions center around), and that will be on the blog next month. If you want to see my first post on Kopari, click HERE. Their deodorant is the only one I wear, and I also continue to love the oil pullers (for natural teeth whitening), the coconut milk, and the coconut melt. Also, although I’m not using it now, I loved wearing the coconut glow during the summer months. I’m also loving the darling sweatshirt (ON SALE NOW!) that Gibson sent to me! And yes…those cute little cuffs are a part of the sweatshirt. It comes in several colorways, but I like the grey and pink floral the best. I’m wearing a small, so it’s true to size. 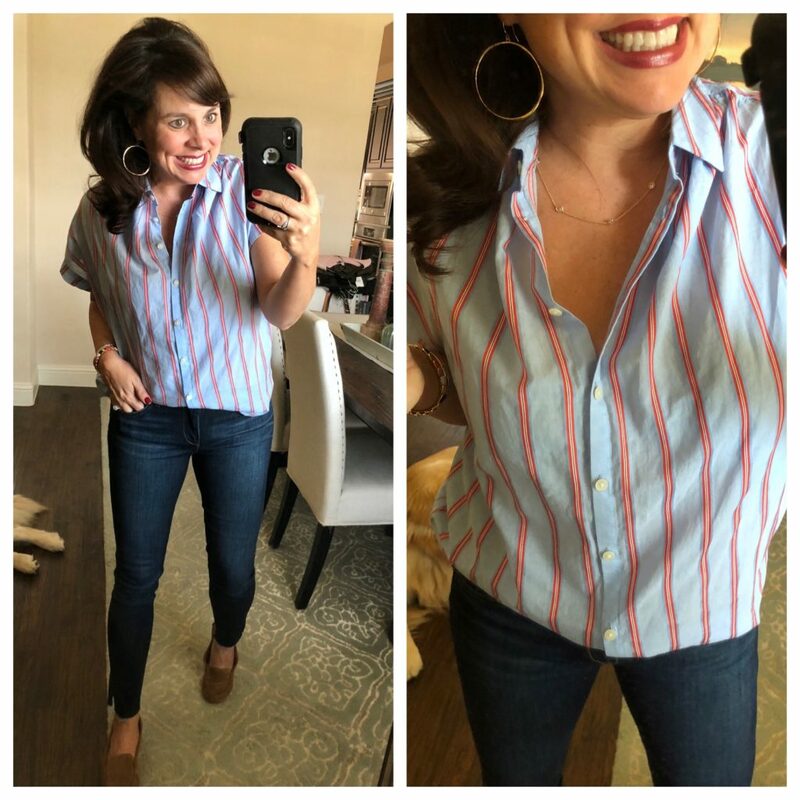 I’m wearing a 27 in the jeans and my regular size in the loafers (but you might consider sizing down in the loafers if you are between sizes). 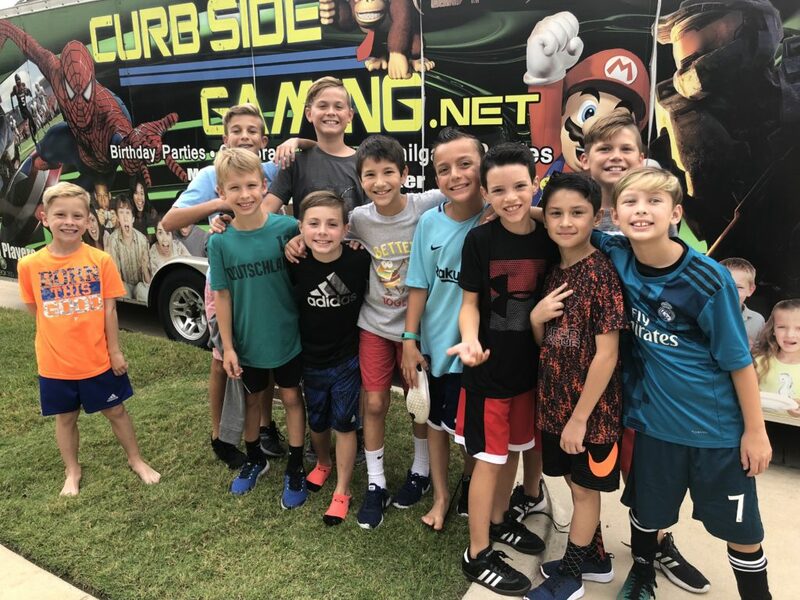 For Carter’s birthday we had a video game truck come to the house. We did it when he was 7, and it was the easiest party ever, so I was happy to repeat it again. 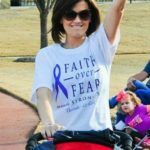 I’m not sure if I’ve ever shared this on the blog before, but I’m not an awesome birthday party mom. In fact, there are some pretty epic stories about my birthday party skills (or lack thereof). All my friends are laughing right now. Like, one year we had his party at The Little Gym, and I told everybody that the siblings could come too. And then I found out that the siblings were going to be like $12 extra a kid….so then I called everybody and was like “Never mind. Your other kids can’t come.” Hahahaha! 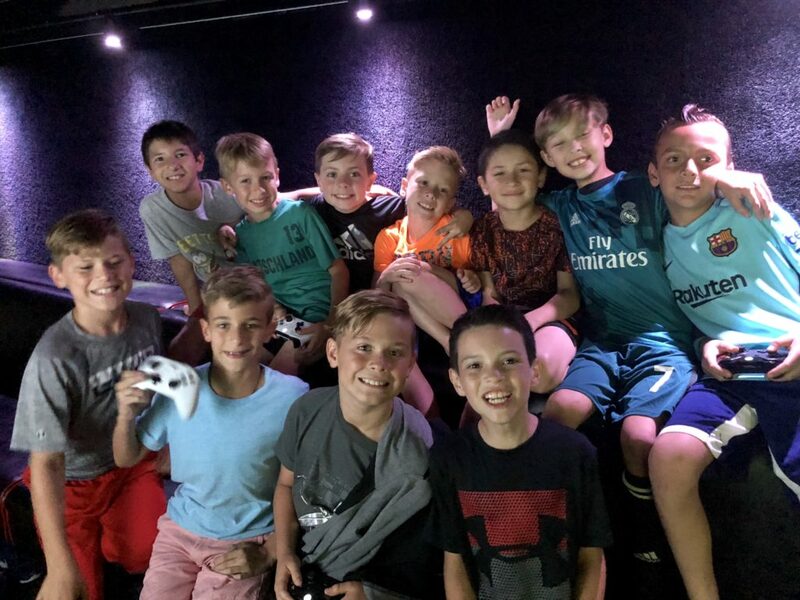 Here’s what you need to know about a video game truck party: they aren’t cheap, but I think they are totally worth it. You seriously won’t see the kids for an hour and a half unless you choose to go in the truck. 2 kids emerged from the truck for a bathroom break, and they were back in the truck within like 2 minutes tops. We stared at the outside of a truck for an hour and a half, and it was GLORIOUS. Here’s Carter and Brody (Conner’s son) at the end of the party. 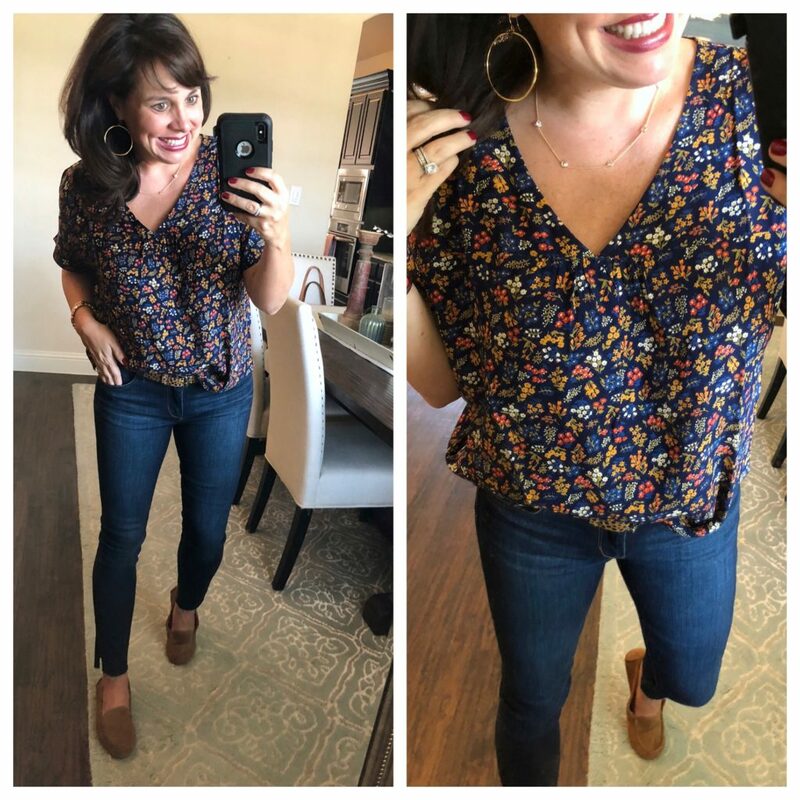 (Click HERE if you still need to see Conner’s WORK WEAR post from Wednesday!) These 2 boys sure do love each other. And don’t you think they look soooo much alike here? They wore matching Adidas shirts unintentionally, but Brody sure did think it was cool! Well, not this weekend….but Tuesday I leave for L.A.! More details to come, but I’m lucky enough to be participating in a collaboration with Nordstrom and Gibson. Several of my blogger friends and I, as well as some bloggers I haven’t met yet (but am SO EXCITED to get to know! ), are meeting up in L.A. for a photo shoot for a HOLIDAY GLAM COLLECTION! Y’all. It’s going to be amazing. And I am absolutely THRILLED to be a part of it. More details to comes soon, but you need to GET EXCITED! Speaking of excited, I have an absolutely incredible deal to share with you today. Have you heard of VineOh!? 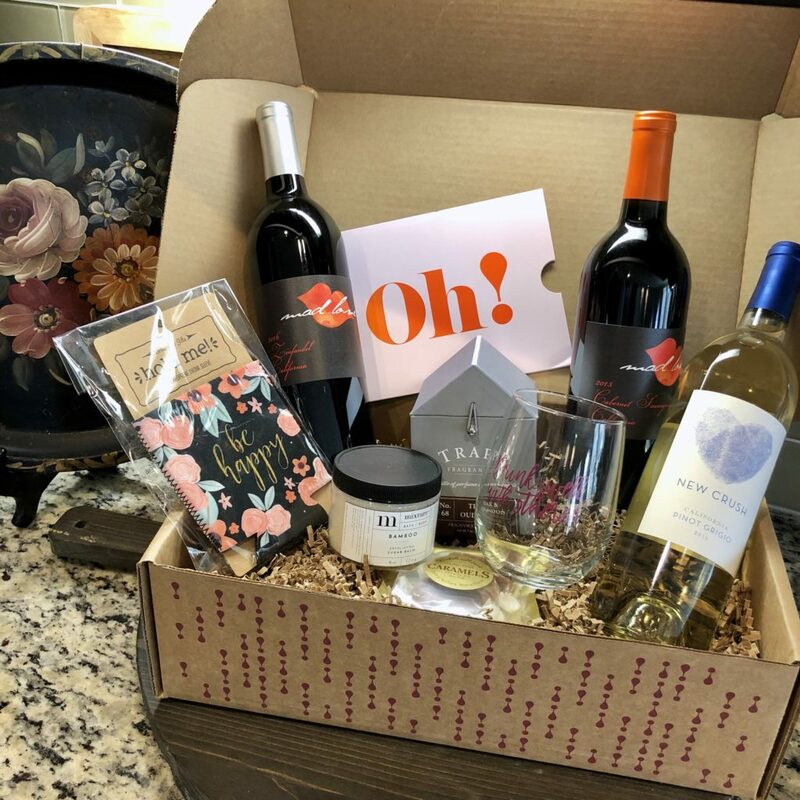 It’s a quarterly (4x a year) Wine and Lifestyle subscription box for women! Subscriptions are typically $59.99/quarter or $224/year. HOWEVER, through 10/15 (or while supplies last), you can get $10 OFF your subscription with the code TOLDME. To confirm, the $10 off is valid on a new quarterly or annual subscription. Not valid on 1-time gifts. No obligation. Can cancel anytime. And that code won’t just get you $10 off the box, it will also get you a FREE Extra Bottle of wine and a FREE stemless wine glass. So, you’ll get everything you see below for just $49.99 + free shipping! And it’s a $175+ value! WHAT AN AMAZING DEAL! Gift it to yourself, gift it to you mom, your sister, or a girlfriend. What a wonderful way to treat yourself or somebody you love! Look how amazing this box is! I mean, what woman wouldn’t be over the moon to receive this box?!? 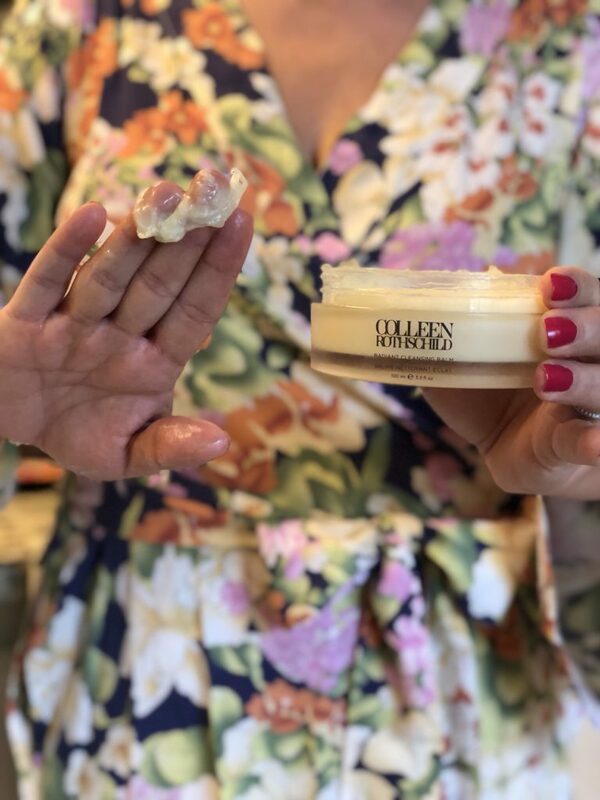 * Here’s whats in the box: The following full size items are fun, rejuvenating, and delicious: 1) Mixture Sugar Balm Scrub Retail Value $36: This balm scrub brightens and invigorates dry, dull skin. Made with sugar and a nourishing blend of oils, your skin will feel refreshed & moisturized after just one use. Perfect for an at-home spa treat! 2) Trapp Candles 50-Hour Poured Candle – Retail Value $29: From the packaging to the fragrance, you’ll be oohing and ahhing at this wonderful Trapp Candle. There is literally the equivalent of a bottle of perfume in each poured candle! Fragrances Vary. 3) A Day In The Life Planner Retail Value $12: Need a little organization in your life? Us too! We are excited to share a custom planner designed by a talented artists just for you! This stylish planner pad is perfect to plan out your week! 4) Brownlow Gifts Insulated Drink Sleeve – Retail Value $6: This colorful and trendy neoprene drink sleeve will keep any bottle or can cold and your hands warm. 5) Dutch House Caramels – Retail Value $10: Soft, rich, and delicious! They are naturally gluten-free, and I bet you can’t eat just one! And I’ve got a FUN TIP: If you want to purchase the yearly subscription, you can change the shipping address each quarter – keep first one for yourself, change the address to your mom or other special lady for the next box! It’s the perfect gift to share all year long! All boxes ship for FREE! Visit vineoh.com and use coupon code ToldMe at checkout (for $10 off and the extra goodies). Offer Terms: Offer valid on new subscriptions only. Valid thru 10/15/18 or while supplies last. I’m in love with this box and I know that y’all will love it too! Thank you to VineOh! for the box and for the discount code! ALL THE NEW SERIES PREMIERS!!! Y’all……..I cannot wait to watch This Is Us tonight! I had girl’s night last night, so it’s just on my DVR waiting to make me cry. And you can better believe I’m going to be watching A Million Little Things. Buddy is dreaming and making all sorts of noises right now right next to me. I’m currently working on ALL THE OUTFIT PLANNING and all the POST PLANNING! You know that L.A. trip that I mentioned? Well, I of course want to have cute outfits when I’m there! So I’ve been ordering clothes for the trip (which I’ll show you in a minute)! And I ordered this luggage. It arrived, and I’m so happy with it! I’ve also been trying to get ahead on posts. I have several posts coming up that I’m super excited about. 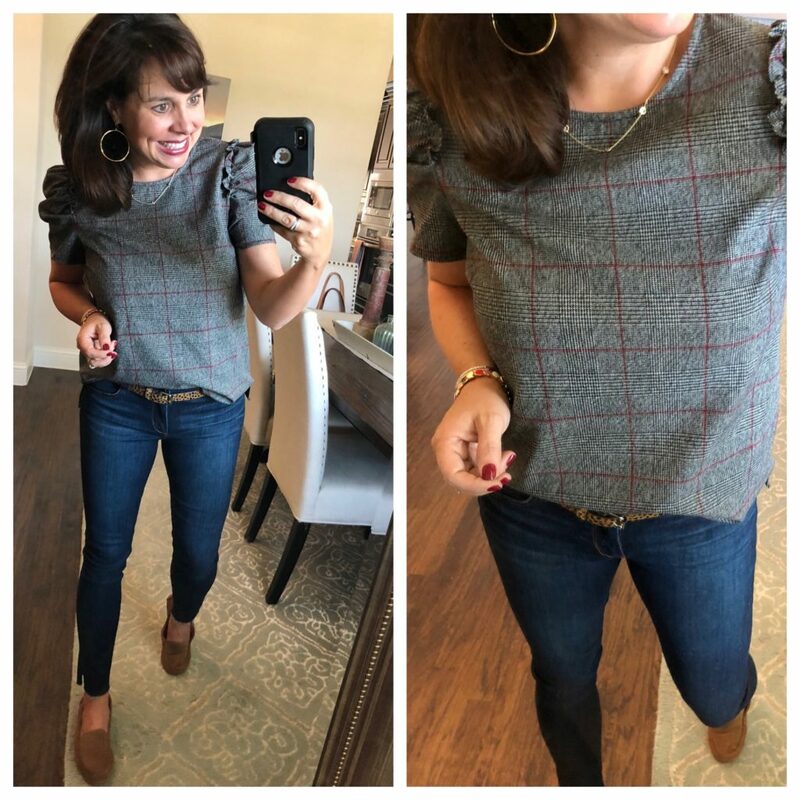 I already told you about Kopari…but I’m also currently working on another bracelet post with Victoria Emerson and a front porch makeover with eBay! Lots of good stuff in October, y’all! Okay, so I just mentioned about packing for the L.A. post. I got several items in that I’m SO excited about, and I know you’re going to love them too. You’ll be seeing some of these outfits again in my trip recap that’s planned for October 12th, but you’re going to get a selfie sneak peek right now! I’m showing all of the following shirts with these earrings, this bezel necklace these ankle jeans, this leopard belt, and these UGG loafers. 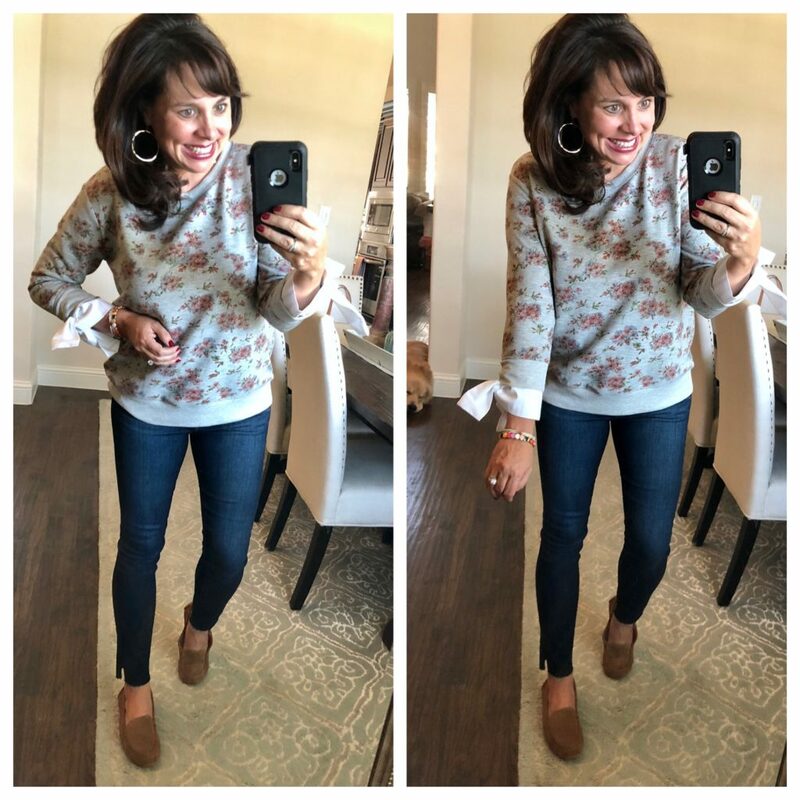 I’m telling you, you can mix and match these items with pretty much any top or sweater, and both the jeans and the shoes are made for travel (because both are so comfy!). 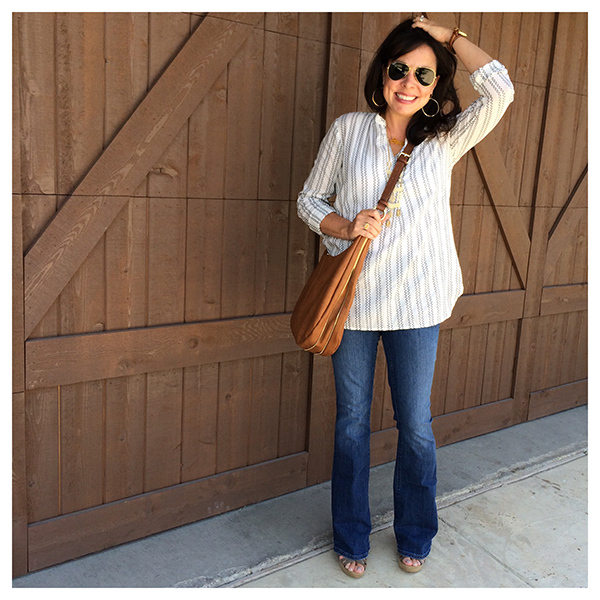 This Madewell Central striped shirt is perfectly oversized and wonderfully transitions from summer to fall. It is oversized, but I still went with my regular size small. Even though it’s on the shorts side, I still prefer it with a half tuck. Ladies. This shirt surprised me. I loved the color, I loved the embroidery, and I loved the style. However, I was certain I wasn’t going to love it on me. WELL. I was wrong. Because I do love it! You can see on the left that it’s definitely a shorter length than I typically wear, but you can see on the right that it’s still just long enough to do a half tuck. I’m wearing a small, and again, it’s just the perfect amount of oversized. 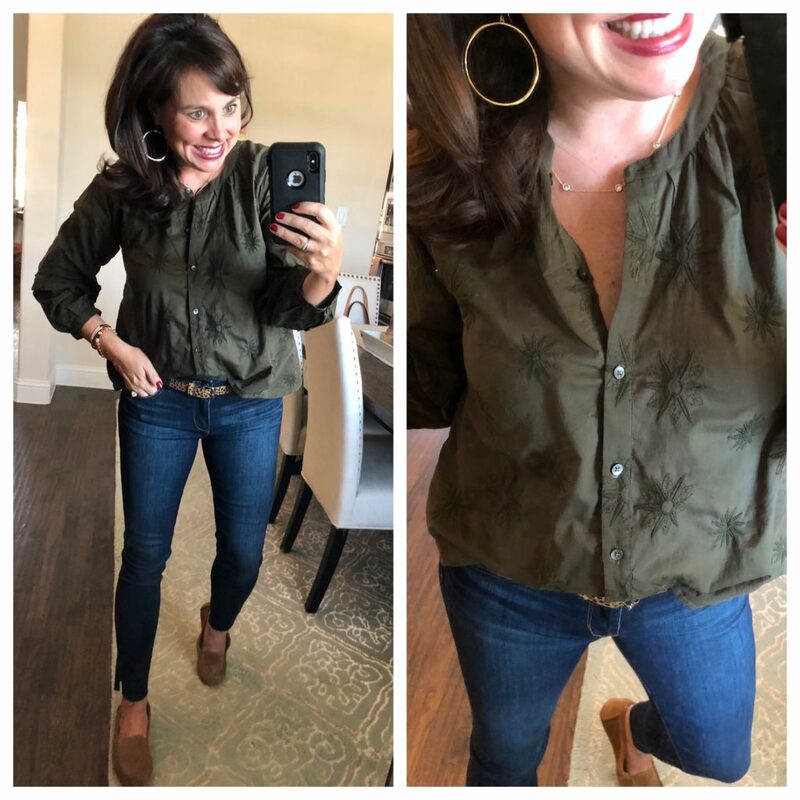 And I have to tell you, I’m a BIG FAN of these Sam Edelman ankle jeans. 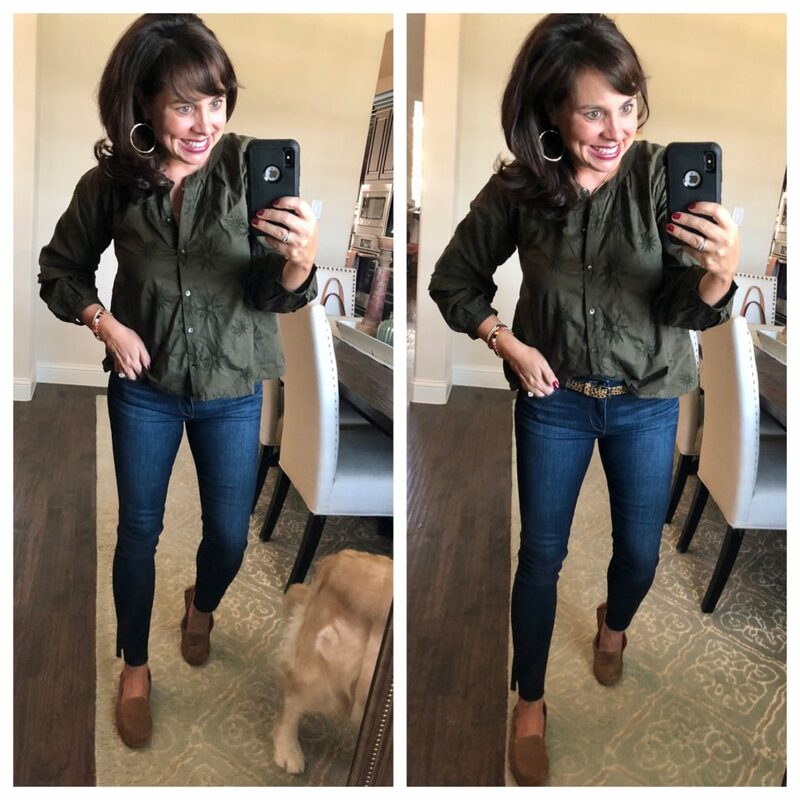 Click HERE if you want a thorough review of the jeans (I wear my regular size 27s). And I thought you might want to see the top close up. Such pretty details! And the necklace is dainty and pretty and perfect. This next top caught my eye online, and I knew I had to try it. 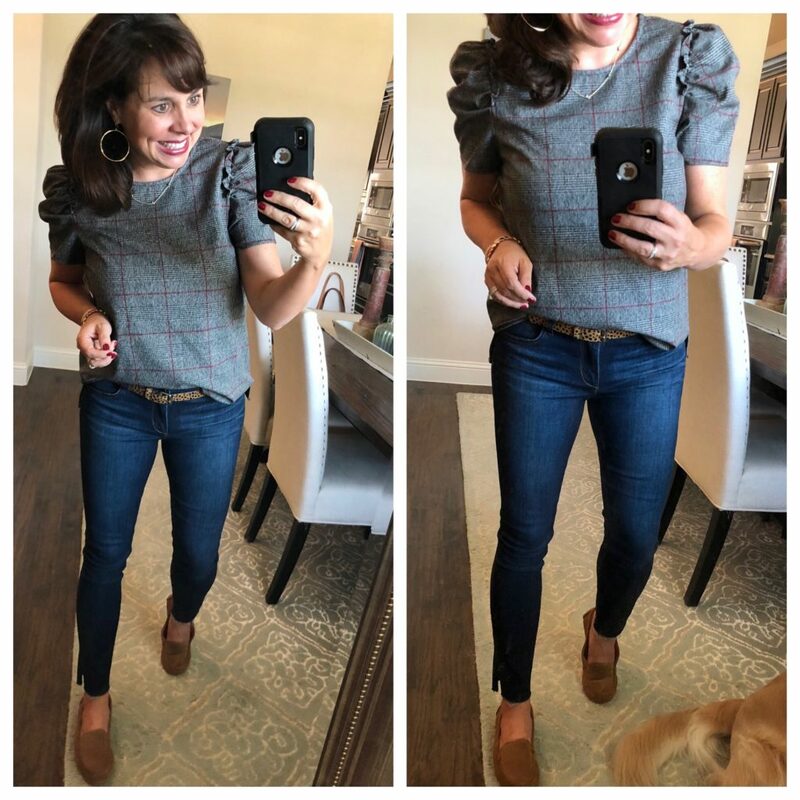 This pattern is a menswear inspired plaid, but it has ultra feminine ruffle sleeves that are DARLING. I sized up to a medium for this top. If you don’t have a large chest, just stick with your regular size. And here’s a little bit of a different view. I MEAN. It’s just plain cute. The sleeves have me swooning. BONUS QUESTION: What’s your favorite way to eat/drink pumpkin. Okay. I’m about to say something shocking. I hate a pumpkin spiced latte. I KNOW, I KNOW. I don’t like pumpkin pie either. BUT I LOVE A PUMPKIN BREAD! Click HERE for this great one. 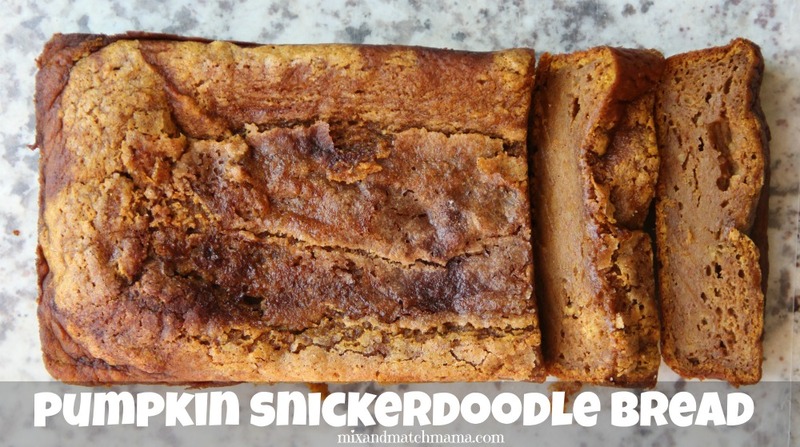 Pumpkin AND snickerdoodle? SO. FREAKING. DELICIOUS. One more thing, y’all! I’ve got some SALE ALERTS for y’all! For all of you devoted Colleen Rothschild users, EVERYTHING is 25% OFF right now with the code HBD25 to celebrate Colleen’s birthday! If you are already a CR lover, she introduced a new matcha tea toner just this week! I can’t wait to try it! 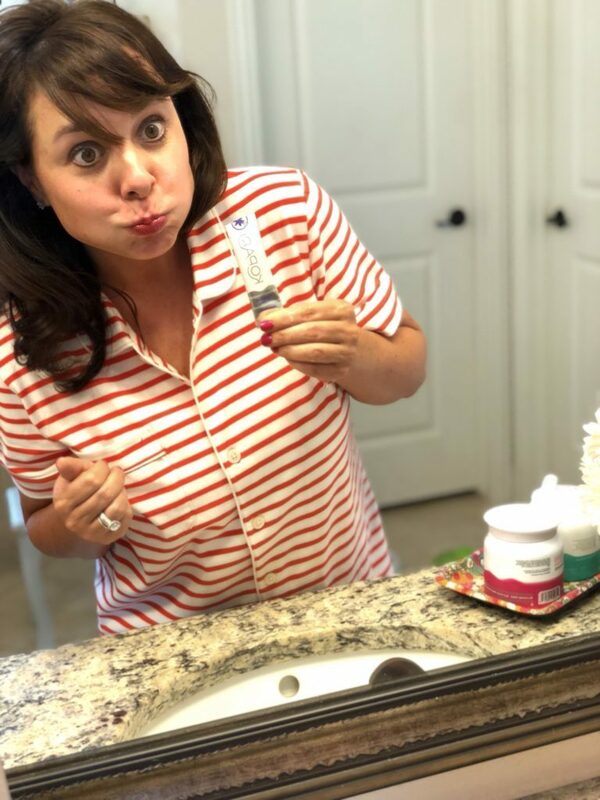 Click HERE to head to my skincare post where Colleen herself recommended a morning and nighttime routine for me. You can also head to my highlight reel on instastories and scroll to SKIN CARE where I talk about and show my favorite products! You know the cleansing balm is my absolute favorite. 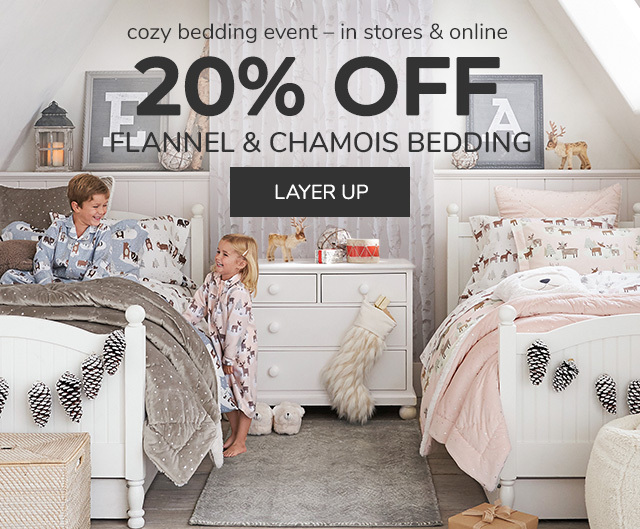 And I know there are tons of you that live for Pottery Barn kid’s sheets. Click HERE for the sale and use the code SHIP4FREE for FREE SHIPPING! And the code FREESHIP will get you free shipping over at the regular Pottery Barn too! See y’all back here on Friday! And don’t forget to link up! Your top last night had the perfect fall colors! It was so cute! Love that cute sweatshirt…looks comfy! You were adorable in that top last night!! Continued prayers for that sweet little boy. I am so sorry to hear about Holt…many prayers being sent their way. 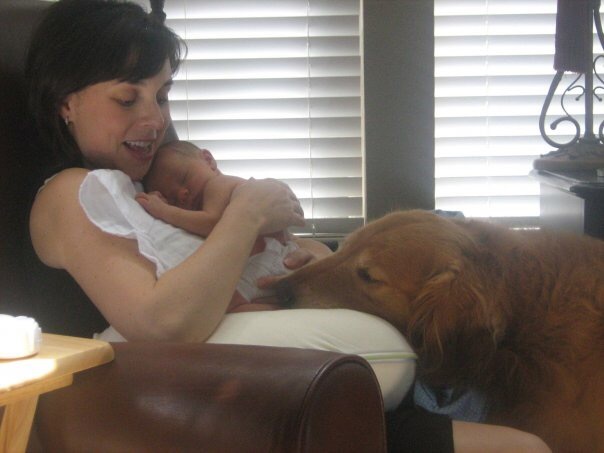 The picture of you with baby Carter and Scout just did me in. So so sweet!!! Also loving all of the outfits you’ve been posting!!! Love all these outfits on you!! I can’t stop wearing those UGG loafers either…crazy comfy!!! Can’t wait for LA next week!!! My thoughts and prayers are with Holt and his family. Do you wear socks with your UGG’s loafers? It doesn’t look like it in the pictures. Continuing to pray for Holt and his family. Your cousin’s Caring Bridge post broke my heart, but God is faithful, and I will pray with faith for Holt’s healing. I’m so excited about the Vine OH! Subscription box! I can’t wait to try it myself and gift it to my sisters and friend over the next year! Thank you for the update. Continued prayers for sweet Holt and his family! Thank you so much, Kathy! My youngest son wanted a video game truck for his birthday SOO badly but we couldn’t find one anywhere around here. I’m not a huge pumpkin spice fan but that bread sounds amazing! Wife, mom, and accidental fashion blogger. I have a passion for sharing things I love with others, and that's what Sheaffer Told Me To is all about! © Copyright 2016 Sheaffer Told Me To · All Rights Reserved. SHEAFFER TOLD ME TO RUNS ADS PROVIDED BY A THIRD PARTY SPONSOR AND USES AFFILIATE LINKS AND COOKIES WITHIN THIS SITE. PURCHASING AN ITEM THROUGH A LINK FROM SHEAFFER TOLD ME TO OR SHEAFFER TOLD ME TO SOCIAL MEDIA (FACEBOOK, TWITTER, PINTEREST, INSTAGRAM VIA LIKETKIT) MAY RESULT IN A COMMISSION. CURRENTLY, THIS SITE USES REWARDSTYLE LINKS. MERELY CLICKING ON A LINK DOES NOT RESULT IN A COMMISSION, BUT IF AN ITEM IS PURCHASED AS A RESULT OF THE LINK, A COMMISSION IS EARNED. OCCASIONALLY THE BLOG ACTIVITIES ARE SPONSORED (EX. A PARTICULAR BRAND MIGHT WANT TO BE FEATURED OR MIGHT DESIRE TO HAVE A SPECIFIC ITEM HIGHLIGHTED). SPONSORED POSTS AND CONTENT WILL ALWAYS BE DISCLOSED WITHIN THE BODY OF THE POST. IF A PRODUCT HAS BEEN GIFTED, IT WILL BE DISCLOSED WITH "C/O". PLEASE KNOW THAT I TURN DOWN MORE SPONSORED POSTS THAN I ACCEPT. I DO NOT FEATURE ALL PRODUCTS THAT HAVE BEEN GIVEN TO ME, ONLY THE ONES THAT I TRULY LOVE! IF YOU HAVE ANY SPECIFIC QUESTIONS ABOUT MY DISCLOSURES OR AFFILIATE LINKS, PLEASE FEEL FREE TO CONTACT ME DIRECTLY VIA E-MAIL AT PINTERESTTOLDMETO@YAHOO.COM. IN ADDITION, IF YOU SEE ANY IMAGES OF YOURS ON MY SITE THAT ARE NOT PROPERLY CREDITED, PLEASE E-MAIL ME DIRECTLY AND I WILL EITHER REMOVE THEM OR CREDIT THEM IMMEDIATELY PER YOUR REQUEST.